There are two independent guides to the legal profession in the UK which research and produce directories about the UK legal profession. The only way a law firm or individual lawyer can get into either of these directories is on merit alone: if their researchers think they are good enough for inclusion. 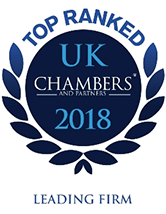 As a result, their listings are highly sought after and represent a true accolade to the firms, teams and individuals who receive a rating and a mention. The two bodies are Chambers and Partners and Legal 500.